Time is marching on! I can hardly believe I am typing the words 3rd trimester and that those words are associated with me! It is the BEST feeling in the world. We have had a very busy few weeks. We traveled to the East Coast for the holidays, landing in New York on Christmas Day. The feeling was magical. I have always wanted to see Rockefeller Center at Christmas and the BIG tree you always hear so much about. We had a GREAT time walking the streets of New York, taking in the sights despite the FREEZING cold. My entire face was chapped by day two. We even got some tickets to see the Rockette’s Christmas Spectacular, definitely a highlight. We were able to get the tickets after being escorted to the front of the line at the Times Square Discount Broadway ticket line. Apparently, if you are pregnant, you are able to jump to the front. A huge blessing considering it was 36 degrees and pouring rain along with a wind that was just piercing to every exposed inch of skin. After New York, it was on to Virginia where we met up with my parents, older brother as well as my husband’s sister and brother in law. We hung out for 4 days perusing the sights of Jamestown and Yorktown. It was a lovely time and so wonderful to just be with family. Made me realize how much I miss my family. They really are such a blessing and I am so thankful for them! The 7 of us spent each day all together. My parents had flown out from Washington State and it just happened that my brother and sister in law/brother in law live within 15 minutes of each other out there. The trip ended all too quickly! We are finally getting the last little bits of our registry together. I am sure there are so many things I have forgotten and maybe even a few things that aren’t really necessary. It is so hard to know on this side of the game. We also have just started our nursery. I am excited to see if the mental image in my head comes out well in real life. I will post pix soon! Some of our friends have begun to pass down their baby items and clothes to us. We now have 3 huge boxes of clothes! We have been trying to keep things organized in the closet until we get our furniture in there. So much fun though! I love looking at all the little items and sweet pjs and onesies. Such a gift, really!!!! Hard to believe our little girl will be here in less then 3 months. The uncomfortable huge belly thing is beginning to happen. After a fairly easy and uneventful pregnancy the back pain started with a vengeance yesterday that left me tearful and slightly over emotional. I just feel like it is too early to be feeling this way. There is still SO much more I want to get done and I need a few more productive days to get our nursery done. I am just hoping it was a fluke (wishful thinking) and that maybe I overdid it the day before. We will see. I met up with a friend for dinner later in the evening, which was absolutely WONDERFUL, but ended up having to cut it short as I could no longer sit down. It was just too painful. How do you go from feeling great one day to painful and can barely sit? 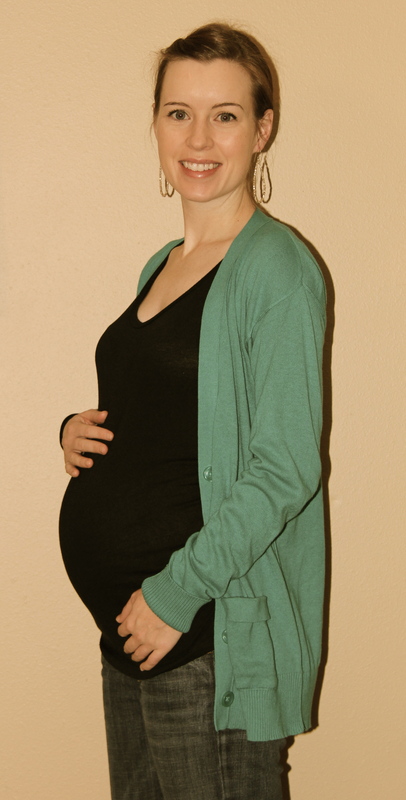 I am going to post a bump pic since it’s been well over 2 months since the last one. This baby girl is a growin….